As federal backing of for-profit education programs grows under President Trump and U.S. Education Secretary Betsy DeVos, watch-dog reporting on such initiatives will be of the utmost importance. In that spirit, here’s a pair of fascinating reports emerging today on for-profit initiatives aimed at high school and college students. First, a ProPublica report examines publicly-funded, “dropout recovery” schools in the state of Ohio, where for-profit companies have sought to fill the void for students departing traditional public schools. According to the report, at least one of these companies may be billing the state’s taxpayers for students who aren’t actually attending class. In one room, vacant chairs faced 25 blank computer monitors. Three students sat in a science lab down the hall, and another nine in an unlit classroom, including one youth who sprawled out, head down, sleeping. Only three of the more than 170 students on Capital’s rolls attended class the required five hours that day, records obtained by ProPublica show. Almost two-thirds of the school’s students never showed up; others left early. Nearly a third of the roster failed to attend class all week. 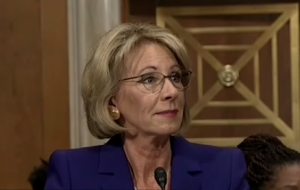 U.S. Secretary of Education Betsy DeVos has championed charters and for-profit education, contending in Congressional testimony that school choice can lower absenteeism and dropout rates. But at schools like Capital, a ProPublica-USA Today investigation found, the drop-outs rarely drop in—and if they do, they don’t stay long. Such schools aggressively recruit as many students as possible, and sometimes count them even after they stop showing up, a practice that can generate hundreds of thousands of dollars in revenue for empty desks. Auditors have accused for-profit dropout recovery schools in Ohio, Illinois and Florida of improperly collecting public money for vanished students. ProPublica reviewed 38 days of Capital High’s records from late March to late May and found six students skipped 22 or more days straight with no excused absences. Two were gone the entire 38-day period. Under state rules, Capital should have unenrolled them after 21 consecutive unexcused absences. Though the school is largely funded on a per-student basis, the no-shows didn’t hurt its revenue stream. Capital billed and received payment from the state for teaching the equivalent of 171 students full-time in May. In 2012, Ohio auditors examined a sample of former students and found Capital High had failed to withdraw 90 percent of them in “a timely manner.” Three years later, a state report placed Capital among seven schools with the largest variances between reported enrollment and actual attendance. An EdisonLearning spreadsheet charting withdrawals and enrollments in 2015-2016 shows that, on average, the student totals Capital submitted monthly for funding exceeded its internal tally by at least 24 percent. Told of ProPublica-USA Today’s findings, both Ohio’s state auditor and its Department of Education said they would investigate Capital. Because enrollment is constantly changing, “a single snapshot of enrollment and withdrawals will more than likely not match” state totals, EdisonLearning said. The company conceded extended absences are a “persistent challenge,” but said it shares all student attendance records in “real time” with state education officials. If issues arise, the company said, it addresses and corrects them. The school’s program director, Monica Scott, said she urges students, who often have difficult home lives, to come to class. “I’m telling them you have to get your instructional hours,” she said. Corey Timmons, 19, who graduated from Capital this spring, said he had complained to Scott about students coming and going as they pleased. “It’s not really a school environment,” he said. According to the report, such programs have emerged in Ohio and Illinois as publicly-backed alternative schools that operate much like charters. But, while they serve a student population that’s difficult to retain, the ProPublica report notes for-profit programs have a financial incentive to keep their enrollment numbers high. In Chicago this past year, about 8,000 students attended such schools. In Ohio in the 2014-2015 school year, more than 16,000 students did, including some who attended online-only programs. For-profit school management companies like Capital’s parent, EdisonLearning, have rushed into this niche, taking advantage of the combination of public funding, an available population of students and lax oversight. EdisonLearning and other for-profits sometimes sign contracts with local school districts to manage these dropout recovery schools. In Ohio and a few other states, though, companies have often operated them as charter schools, which are publicly funded but independently run. After pulling in students long enough to tap public money, many of the schools fail to keep them in class. In Ohio in 2016, for-profit companies ran nearly a third of the state’s 94 charter schools for dropouts – but three-fourths of the 20 with the highest absenteeism rates. “They were trying to get the children in, but didn’t know what the needs were,” said Monique Newburn, a former EdisonLearning teacher who worked at one of its dropout recovery schools in Chicago. EdisonLearning and its competitors say their curriculum and instruction are well-designed to help borderline students earn diplomas and avoid the devastating consequences associated with quitting high school, such as lifelong unemployment and underemployment. Even detractors acknowledge that rescuing dropouts is difficult work, and a high rate of failure is likely. Yet dropout recovery schools like EdisonLearning’s have incentives to inflate enrollment counts. Unlike traditional schools, they serve the most unreliable students. They must hustle to attract enough enrollees, while traditional schools get a steady stream of kids from their residential zone. In 2015, Ohio auditors found, for-profits ran five of the seven dropout recovery schools with the biggest gaps between reported and observed enrollment. Ohio doesn’t have education money to spare for ghost students: This year’s state budget froze or cut funding for most school districts. Also of interest today, a new report from the National Center of Education Statistics highlights some troubling data concerning for-profit colleges, according to The Associated Press. Students who attended for-profit colleges were twice as likely or more to default on their loans than students who attended public schools, according to a federal study published Thursday.